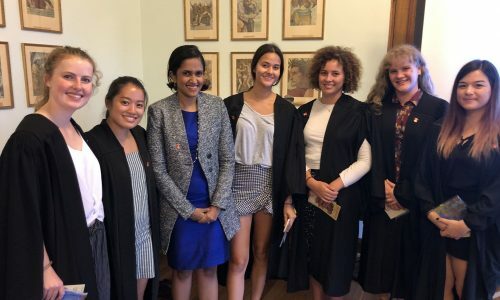 At Monday’s Formal Dinner, we were thrilled to be joined by Sancta Alumna, Heshani Bogollagama who visited Sancta to share her inspiring career journey with students. Heshani is Chairperson of the National Craft Council of Sri Lanka and Managing Director of a leading Sri Lankan property development and real estate company. Heshani described how the Sancta motto, ‘Walk in Wisdom’ guided her when she found herself thrust suddenly into the Managing Director role, following the passing of her father who had previously run the property company. She remembers being the youngest employee in the company of over 200 staff, and needing to quickly find her leadership style despite having very little experience. It wasn’t until Heshani began as the Chair of the National Craft Council of Sri Lanka that she finally felt her values, passion and knowledge and skill set had aligned. This role has given her the ability to pursue her passion for economic development, by creating and implementing the plan to give economic and social prosperity to traditional craftspeople throughout Sri Lanka. Through implementing craft education programs in schools, and partnering with The University of Colombo to deliver specialised training in both business and authentic craftsmanship to rural communities throughout Sri Lanka, Heshani and her team at the National Craft Council have achieved significant changes in social stigmas towards the profession of craftsmanship, and have inspired exciting new livelihood opportunities for rural craftspeople from poor backgrounds.